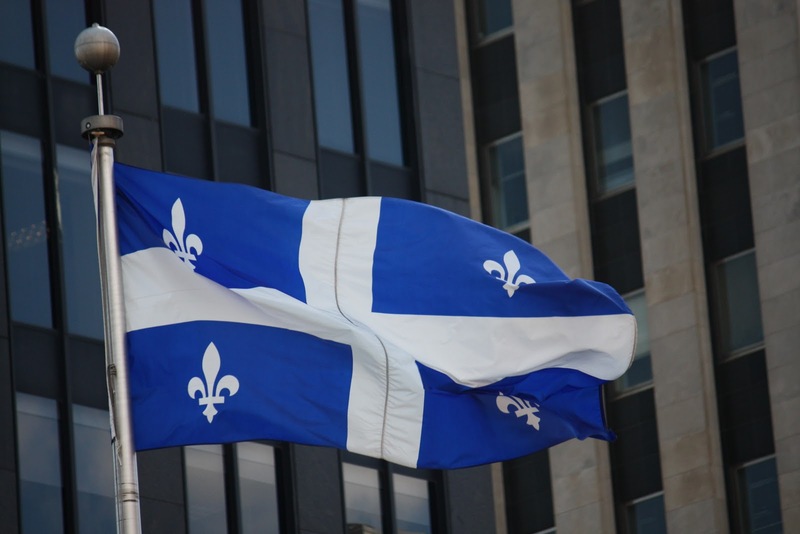 Quebec is Canada's largest province by area, and the only province in Canada which has French as its official language. The first Europeans to arrive in the area that now makes Quebec where Basque (an area now split between France and Spain) whalers and fishermen. The French tried to start colonies in the area from the early 1500's, but none met with success. However, French fishermen where regular visitors. However, in 1608, Quebec city was founded as a trading post with the locals, with the locals trading furs and other goods for French made products, such as metal items, like tools and weapons. As the French spread out, the French government took to naming the region New France. However, its population remained low. In order to keep control, the French government limited immigration into New France to French Roman Catholics. This then prevented anyone of any other religion from settling. The New France government began to take tougher measures to expel British traders as they moved down the St Lawrence river. This led to tension, and ultimately, conflict. By the late 1750's, full conflict had broken out, and the 7 Years War was being fought between Britain and France all round the world. Ultimately, France lost. The 1763 Treaty of Paris ceded the northern New France territories to Britain, and the southern territories to Spain. Apart from a few islands, France had now been removed from continental North America. By Royal Proclamation in1763, Britain's new Canadian territory was renamed to Quebec. Unrest in Britain's American colonies led to a rise in concern that the French Canadians in Quebec would also rise up. 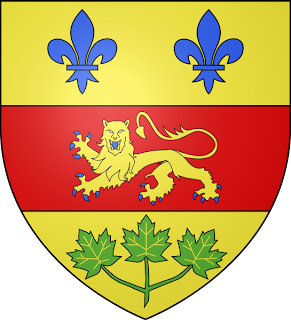 This led to the Quebec Act in 1773, which laid the foundations for Quebec to maintain a unique status amongst the other provinces that would eventually make up Canada. 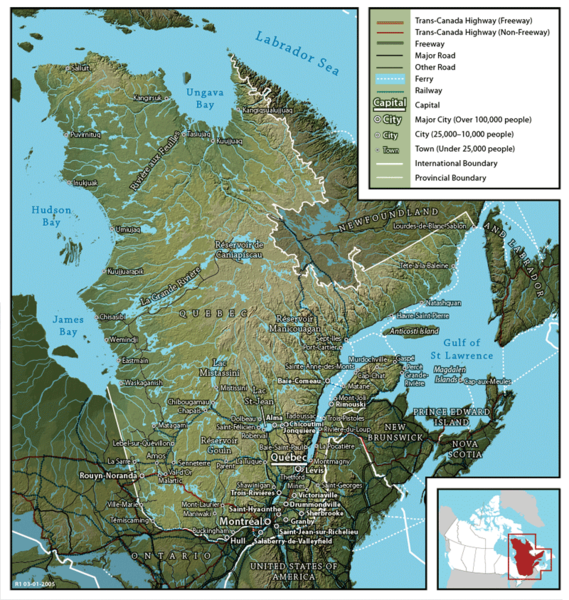 After the American Revolution, many Loyalists moved north into Quebec. However, they where not happy with the Quebec government, still being patterned on French lines. Also, with education and linguistics also being dominated by French. The English loyalists demanded changes. However, unwilling to make changes, the decision was made to split the populations. The French Canadians lived round the cities of Quebec and Montreal. In the West. So, the newly arrived English where awarded land in the territories east. This territory would eventually split away and form Ontario. Confederation came about on the back of the British North America Act of 1867. This led to New Brunswick, Nova Scotia, joining a newly split Quebec and Ontario in forming the start of the new Canada. 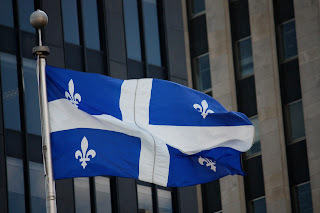 Today, Quebec maintains a unique status in Canada, with its own French style of government, an French as its official language. Nationalism plays a huge part in Quebec. So much so that in 1995 a referendum on breaking away from Canada failed. But only just. Today, independence less of an issue. Unity is preferred by just over 50%, whilst independence by mid 30% of the population. 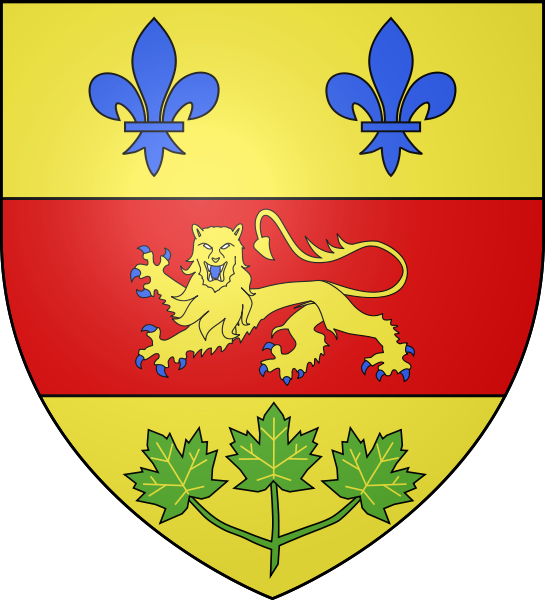 The Coat of Arms for Quebec where adopted in 1939. This new Coat consists of a shield split into 3 parts. The top third is blue, with 3 fleur di lys representing France. 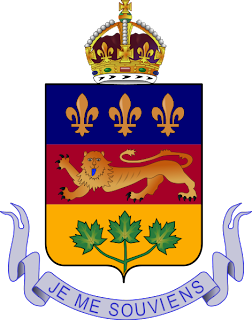 The central stripe is red with a Gold lion, representing Britain, and the bottom is gold, with 3 green maple leaves representing Canada. The shield is then topped with a Tudor Crown. However, the first one, granted in 1868 was very slightly different. It did not feature a crown, and only had 2 fleur di lys. This time, blue on gold. 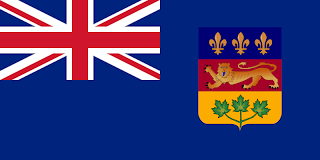 Quebec had been using the Canadian Red Ensign, as well as a deeply unpopular Blue Ensign which, given many peoples French history, did not sit well with Quebekers. So, a push was on to design a unique Quebec flag. In 1902 the first popular one, the Carillion flag, was raised. A White cross on blue, with 4 gold fleur di lis placed in each corner pointing inward. 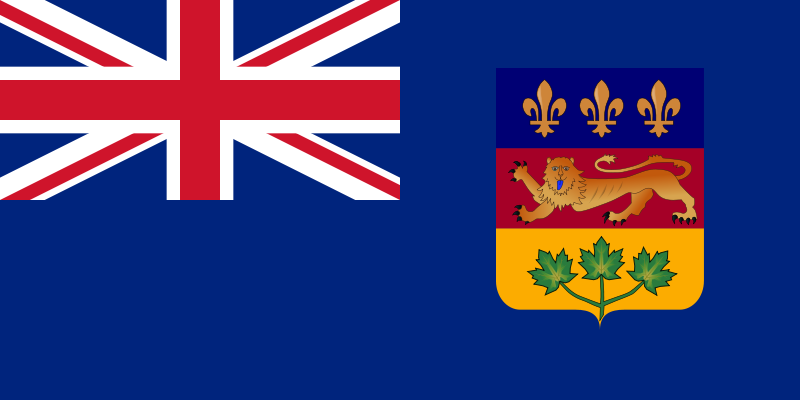 In 1947, an independent legislative member pushed hard for a new flag to replace the Blue Ensign which had never been used. Burroughs Pelletier had been asked to put forward some proposals, which he did. Most of which where a variation on a white cross on blue, with elements from the Coat of Arms. However, he did stay around to give advice. Finally, in 1948, a new flag was revealed. 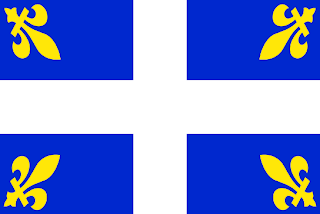 This was remarkably similar to the Carillion Flag. It had a white cross on blue but rather than gold fleur di lis, it had 4 white fleur di lis, one on each blue quadrant, and all pointing up. Contrary to popular belief, the white fleur di lis are not taken from France, which used golden ones, but the white was taken to represent purity. The flag itself is very popular, and has been ranked as the top, or one of the top flags representing a state in North America. It also provided the inspiration for the Quebec Nordiques Hockey team, which took the same shade of blue, white stripes, and fleur di lis and incorporated them into their uniform.